It used to be that some people were regarded as gifted communicators and everyone else had to work hard at developing their skills. Then, about 40 years ago, along came NLP which began identifying the skills that apparently ‘gifted’ communicators used. One of many obvious-once-it’s-pointed-out discoveries the NLP came up with was the famous, and sometimes infamous*, NLP Eye Assessing Cues method. Used with skill this enables us to know how a person is thinking from watching how they move their eyes. Sounds spooky? Well, it’s not. Yes, we can identify how they are thinking. And, no, we cannot identify what they are thinking. Which is quite reassuring. How they are thinking i.e. whether they are thinking in pictures, sounds, feelings or are thinking analytically. What are the ‘standard’ eye directions? Move up and diagonally to the right or left – likely to be thinking in pictures. Staring fixedly ahead or somewhere in front – possibly thinking in pictures. Look horizontally left or right – might be thinking in sounds. Down and to their left – may be thinking analytically or sub-vocalising. Are these NLP Eye Accessing Cues useful? Yes, they are very useful. If you know how a person is thinking you can tailor your style of communication to suit them. For example, let's say that Sharon the manager wishes to explain a fairly complex procedure to Greg, a team member. Sharon has developed her skill in noticing the NLP Eye Movements and is aware of the 6 requirements listed below. This is not an absolute ‘diagnosis’ but it does suggest that she might want to ask a few questions to check what’s going on for Greg. If Greg’ eyes frequently move to the ‘visual directions’ (see diagram) it suggests to Sharon he may be thinking in pictures e.g. imagining what she is saying and or checking with pictures from his memory. If Greg’s answer verifies that he is following her through his inner images, Sharon can now can tailor her explanation to suit Greg by showing him pictures of the procedure, drawing diagrams, and by speaking a little faster and in a slightly higher tonality. If, on the other hand, Sharon recognises Greg is looking mainly diagonally down towards his right this suggests he is likely to be thinking in feelings. Once again she will verify this by asking a few questions. If Greg is following her explanation through his feelings (or his ‘kinaesthetics’ ) she recognises that this will be a quite different experience form him to thinking in inner images. So Sharon will adapt her style: if possible she will physically demonstrate the procedure rather than talking about it, get Greg to actually do things, speak with a slightly lower tonality, allow Greg lots of ‘thinking pauses’ in her delivery, and recognise that Greg is likely to prefer ‘doing’ rather than 'listening to' or ‘talking about’ things. If Sharon notices that Greg is looking down and to his left she will come up with a provisional hunch that he is thinking in analytical self talk. She will, of course, then check that this is the case by asking a few questions. expect that he will respond best to formal structure for the meeting, a brisk and business-like tonality and a minimum of small-talk. The sound or ‘auditory’ direction is less commonly encountered than the other three. He is likely to respond best if she uses a modulated voice tonality rather than a high-pitched fast paced one. Are these eye directions true? Lots of books and web-information suggest that these ‘standard’ Eye Accessing Cues are ‘true’ and ‘fixed’ i.e. if a person looks down and to their right they are definitely thinking in feelings. It is an over-simplification and is misleading. It is also something which the originators of NLP first warned against over 40 years ago. And it is also something which many reputable NLP trainers continue to warn against. Why? Because in NLP we treat the set of standard eye directions simply as a hunch or working-hypothesis. They are not ‘true’ – they merely provide us with an educated guess which we then need to check to determine if the person in front of us matches or differs from the standard set of directions. 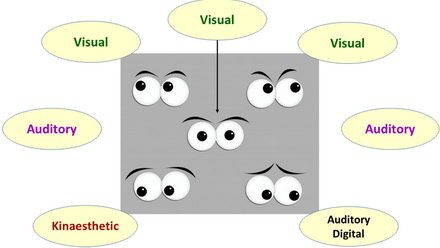 Recognise that it’s important to verify if any one person’s eye movements fits the general pattern. Some people will do it differently. For example, it’s uncommon but some people will have the Feelings and the Analytic Thinking sides reversed). Appreciate that no-one ‘is’ visual or auditory or whatever: many people will switch specialities from one situation to another. E.g. a senior manager might do a lot of Analytical Thinking at work and switch to thinking Visually or in Feelings when he is at home. These 6 requirements need to be in place for the NLP Eye Accessing Cues method to work as it was intended. (*Incidentally, most scientific research into the Eye Movements has ‘proven’ they don’t work but, as no project has incorporated the 6 requirements, this result is inevitable. See http://pegasusnlpblog.com/eyes-dont-have-it-nlp-disproved-or-not. Does looking left and right mean different things? You may have read that eyes moving up and to the person’s left mean they are remembering pictures whilst up and to their right means they are creating or making up images. (The same applies to the ‘Sound’ directions – to their left is supposed to indicate remembered sounds and so on). This can be true for some people, some of the time. But it requires a lot of skill to identify, is fairly unreliable, and requires that you are able to quickly distinguish left from right(!) In almost 40 years of using NLP I have never found this complication worth bothering with. Yes, it can be a good party trick but, in everyday life, if you want to know if they are remembering or inventing a picture it’s easier to just... ask them. You can refine things later. Spend two or three weeks watching for these three and you’ll soon be noticing the eye movements automatically. Watch TV with the sound turned down. Observe people chatting at work or out and about. Devote the first 60-90 seconds of any conversation to eye-watching; no longer than this or you may forget what the conversation is about – or have the other person misunderstand why you appear to be gazing longingly into their eyes! At the beginning of this article I mentioned that when a person’s eyes are moving it indicates that they are thinking i.e. processing information. This means that if you speak while their eyes are moving you may interrupt their thinking. The same applies if you require them to ‘look at me when I’m talking to you’ as some parents and teachers insist of children. The rule: if a person’s eyes are moving you need to be quiet and wait until they have finished thinking. Otherwise you risk confusing them, preventing them from thinking clearly, or irritating them.